I wore this casual mom look last week on a day off. 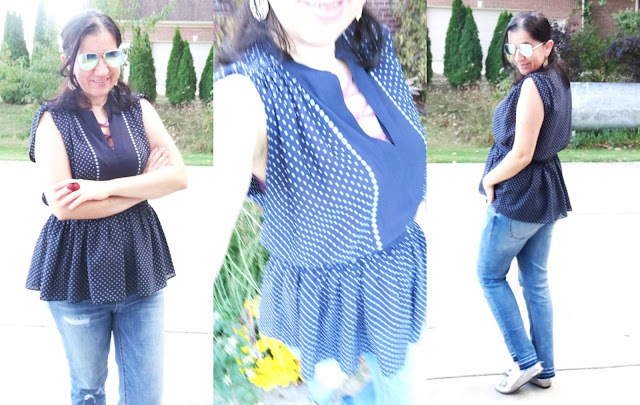 I had a totally-different outfit on, in the morning for dropping Viv to school and then I did a little shopping - where I picked up this Dotty Navy Top at Ann Taylor for a great deal! Later, when I got home I decided to switch the half top of my outfit by wearing my New Peplum Top since the temperatures got in the high 70s. Believe it or now I have been in a lot of short-sleeve and sleeveless tops here in the last couple of weeks. 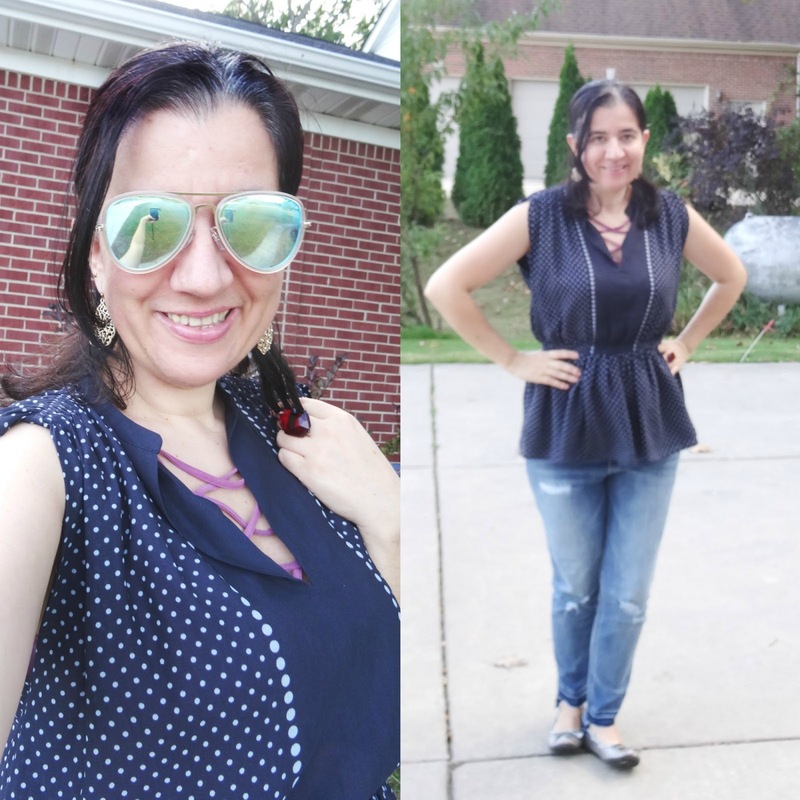 You see, besides my Navy Peplum Polka Dot Top, there is this laceup neckline peeking through and that is another top I put underneath my Navy Blouse. Underneath, I wore this Sueded Soft Lace-Up Mauve Purple Tank Top by American Eagle (this one which is currently on huge sale). I got mine a month and a half ago and paid more for it but my local store only had a few left and I loved it because I thought it would be the perfect layering tank. 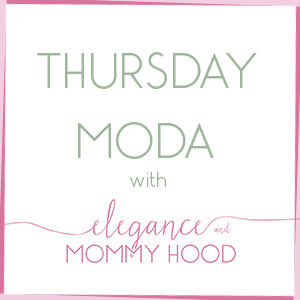 They run small so I am wearing a Medium and I wish they were slightly longer, but if you have some high-waisted jeans this is perfect - it also comes in 4 great neutral Fall shades. As far as my Navy Peplum Polka Dot Top, I cannot find it on Ann Taylor's website since it is on clearance, but they currently have this Gorgeous Ponte Pinstriped Navy Peplum Top which would look great for the office under either a blazer or long cardigan. Of course my Step-Hem Distressed Blue Jeans are one of the 5 items I selected for The Common Threads Challenge which are by Wit+Wisdom and I purchased at Nordstrom during their big sale of the year. 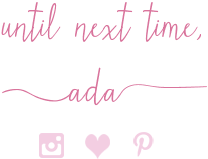 They don't have my jeans currently but similar ones can be found here or here - both pairs are also from Nordstrom and under 60 bucks each. My own jeans were described as Girlfriend Jeans but I'd say they are between a skinny jean and a boyfriend jean. I purchased my regular size 27 (a size 4) but I wish I had purchased the 26. As you can tell from some of the pictures here, they look like they are falling down a little. I need to belt them next time.